This is a rediculously geeky tip. Since upgrading to Vista, the backup program I use (Second Copy) slows down the whole computer to a crawl--the CPU is at 100%. This tip makes it bearable to still use it while it backs up and "fixes" the program using 100% of the computer. This works until you close the program, or restart Window; then you'll have to do the same thing again. What this really does: Most newer computers really have more than one "core" in the main chip, this lets them do several things at once. 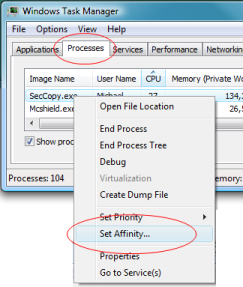 Doing that Affinity sets the program so it will only use one of the cores in the chip--which lets the other core have a break and let you do something. After doing that, on the graph page in task manager, one will be at 100% while the other isn't---where before the program would have them both at 100%.